Don't measure the old foam. Old foam is usually deformed or could be soft. 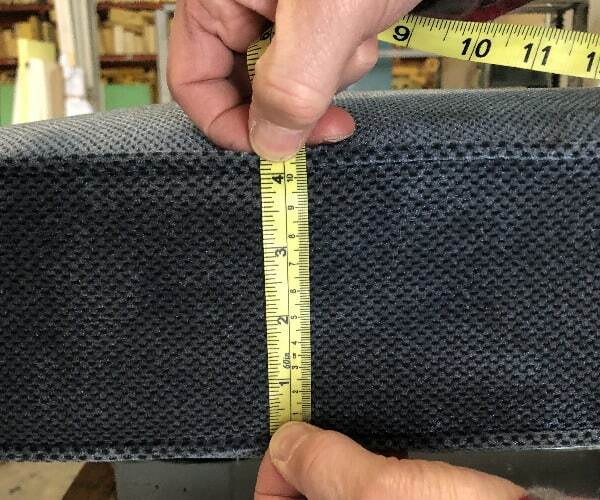 Some manufacturers use an extra-thick, soft piece of foam which should never be measured for replacement. If your foam is rounded on the top or front, don't measure the curvature. (Adding Dacron to your new piece will fill it out nicely and add the same rounding). If your foam is thinner in the front and thicker in the back this is usually a result of it being "worn out" and compressed in the front. Don't take your measurement from the compressed side. When possible, always measure between the seams or between the cording of the case, with the foam inside. If there are no seams and you need to eyeball your measurement, then emulate the photo to the right as closely as possible. You'll have to imagine the seam. The rounded sides are caused by the Dacron batting, so you don't want to measure all the way to the edge. Instead, measure to just before the curvature. When ordering foam with a number lower than 40 (i.e. EverFlex™ V34 or EconoFlex™ C30), you can add 1/2 inch (1.3 cm) to the WIDTH of your cushion. These foams are Medium-Soft and the added foam will fill the cushion cover nicely. When ordering foam with a number lower than 50 (i.e. EverFlex™ V44), you can add 1/2 inch (1.3 cm) to the THICKNESS of your cushion to make a fuller cushion cover. When ordering a rigid foam like EverFlex™ Rebond, consider reducing the THICKNESS by 1/4 inch (0.6 cm), and order the Dacron Book Wrap. These foams are firm and difficult to get into a case. The Dacron will fill out the cases nicely.